Food Costs > How Much Does an MRE Cost? How Much Does an MRE Cost? MRE, or “Meals, Ready to Eat,” are a series of pre-cooked food items that are put into a plastic pouch, known as a retort. These retorts are then packaged and sealed in such a way that they are able to last for long periods of time. MREs were originally developed as field rations for the military. Before World War I, the first ration contained beef, peas and rice. Then, these were replaced by lightweight preserved meals to save weight and allow more of the packed food to be carried by soldiers. But this has been improved. Today, MREs are considered tasty and nutritionally balanced meals that even civilians come to love. Even though these meals are designed for survival in the military, there are other uses. For example, many people choose to keep MREs in their bomb shelters if they are preparing for a disaster. On average, an MRE is going to cost anywhere from $3 to as much as $15 per pack or about $80 to $120 for a bulk case of 13 to 24. MREs can either be sold individually or sold by the case. For instance, the best selling MREs on Amazon.com sell for $10 to $15 per pack, depending on the flavor. A genuine box with 12 different meals per case retails for a pinch more than $80. MREinfo.com said that the average cost of an MRE is around $45 to $60 per case, and the average case has anywhere between 12 to 24 MREs. After some general research, it has been found that anything around 24 pounds for less than $25 is a fair deal. This is the price for a government-issued MRE. According to SurvivalAcres.com, a case that contains 12 meals should cost around $50 while individual meals should average around $4 to $7 per meal when bought in bulk. MREs consist of a precooked and self-contained meal packed in lightweight materials. Each MRE pack will be designed for the average 1,250 calories per meal, and all meals will require no refrigeration, and while they can be consumed cold, it’s highly recommended you use an MRE heating method. These MREs can be purchased by the case, individually as an entree or even as a snack. East standard MRE will come with the main entree, side dish, bread, dessert and a drink. Aside from the entree, it should also come with an accessory pack that includes the silverware, wipes, sugar, salt and Tabasco sauce. When we browsed a handful of retailers, the best selling MRE packs we found included beef stew, chicken alfredo, pizza, omelets, spaghetti, beef brisket, beef strips, pot roast, Mexican beef and chili mac. 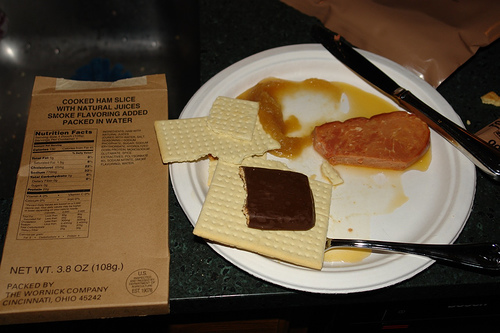 Military-based MREs can commonly be found through someone in the military, army surplus stores, gun shows and eBay. If buying online, and you’re looking for an official MRE, it’s best to look for a picture to ensure you’re getting a legit MRE. This picture should show the meals you’re getting and the pack date. The average shelf life of an MRE is about 7 years; however, if it is exposed to high heat or extreme climates, this number can reduce a lot. If purchased online, some shipping fees may apply if you don’t meet the retailer’s minimum spending requirement. Shipping a large case can often cost $10 to $20. Depending on how you purchase an MRE, an MRE heater may be required if you want to heat your food. These heaters can cost about $2 to $3 each and can only be used once. While most packs will come with one, some individual packages, again, depending on how you purchase it, may not be included. Avoid freezing an MRE because this can damage the product. The shelf life of an MRE meal can be determined by the temperature it’s stored at. If it is stored at 100 degrees, for example, the life can be as little as a month. If stored at 50 degrees, however, the life can be extended to five years. or more. Buying by the case will always save you up to 50 percent.